I was thinking of a way to translate yesterday’s photograph into watercolor. I have figured out a way to paint facsimiles of clouds – generic clouds. It is much more difficult for me to paint a specific cloud. Therefore reproducing ‘Between the Lines‘ as a watercolor would not be easy. It also wouldn’t further any artistic purpose. I painted a generic sky scape and attempted to draw lines that would disappear behind some of the clouds. The boldness of my lines did not match with the delicate clouds. Therefore, it would not make visual sense for such a high contrast line to disappear behind a wispy cloud figure. Instead, I used my dark lines to construct simple forms. The colors within the each geometric outlines were monotone, and contrasted with the varied blue sky background. 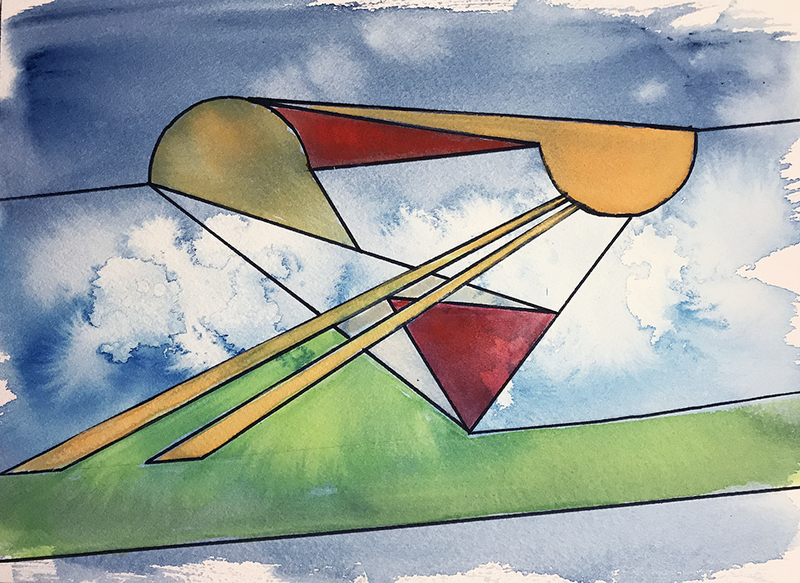 This entry was posted in Personal Stories and tagged abstract art, artistic process, contrast, creative process, creativity, painting, skyscape, visual arts, watercolor. Bookmark the permalink.